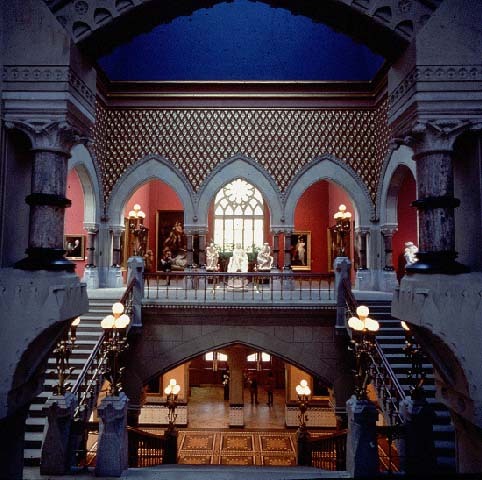 The Museum of American Art of the Pennsylvania Academy of the Fine Arts is an intrinsic part of the school, with classrooms in the lower levels and a permanently installed, priceless collection of American art. Third and Fourth year Certificate Students install displays of their works at the close of the year to compete for prizes and scholarships. MFA Graduates display their professional debuts as part of graduation. The museum has a tri-fold purpose: historical, technical, and professional education and development. Previously Bethany Ayres, I studied painting, drawing and design at the Center for Creative Studies in Detroit, Michigan; and at the Pennsylvania Academy of the Fine Arts in Philadelphia. In 1998, I moved to the bay area of California where I lived and worked until 2013. My image style tells the story of learning how to draw in Detroit: a perspective style with an illustrative bent; influences from the museum next door, the DIA. Composition and materials tests were developed in Philadelphia; and a simplified description with a candy finish was well received in California. The process of my enamel on wood panel paintings from my Oakland studios gave me a way to work more aggressively with my materials while yielding a resilient, furniture-like result. A down economy stole years (2009-2013) from my studio until I moved away from the bay. Now in Vista, California I am recapturing my talent and momentum and using it to build my new life. People form relationships with artworks that they encounter every day. The threshold of impact of any creative product is owned by the composition. When details are minimized, can more happen in the composition? The subconscious mind is always awake / I am in the business of making things look like other things. Are permissions to trespass granted to things that are lovely, especially when amplified by egoism?